We are into day 3 of the festival today and there have been some great fish caught. Heaviest Brown at this stage is 2.277kg. Heaviest Rainbow is 1.231kg. (both of these weights are gilled and gutted) and with 5 days to go there are bound to be some more great fish caught. There are plenty of prizes up for grabs, so why not come and have a go. Rivers:- The great river fishing continues with excellent numbers of Rainbows and a few Browns for good measure. Some welcome rain this week will have helped the higher streams. The dry fly fishing is improving rapidly though most fish are still being caught on Nymphs. There are more and more insects becoming active with the warmer weather. Expect Caddis, Mayflies and Midges. Terrestrials such as Beetles and Ants are in abundance. The Thredbo and Moonbah have been fishing well, but more numbers of fish in the Thredbo. Prince and Beadhead Brown Nymphs under a dry fly have produced the goods. Several Anglers fished the Eucumbene River over the last week and there are still heaps of fish to be caught. One Angler fishing the upper Eucmbene managed to catch 3 Rainbows and a Brown before breaking his brand new rod. He then rigged up his spare rod and caught 10 more fish. To add to the excitement of the day he was attacked by a tiny (6inch) Brown Snake, and had a lighting bolt shatter a tree less than 50 metres from him. The fishing is so good at the moment that even when it seems like everything is against you, you can still catch plenty. Fly fishing from boats has been good over the last few days with anglers finding fish using sinking lines and woolly buggers. There heve been some great plump Rainbows coming using this method but you do have to search to find them. Once you catch one work the area over and you should be able to hook a few more. We have had more reports of termites and ants falling this week and plenty of fish moving on them. It is all about timing for these falls. Warm and still days tend have more of these insects on the wing and usually in the late afternoons. The next morning following a fall can have fish in close mopping them up. Rushy Plains, Seven Gates, Dam Wall, Old Adaminaby and Buckenderra have all been good areas. Best flies have been Brown nymphs, Beadhead Wooly Buggers and Windlane Nymphs. Reports from Jindabyne have been scarce but those that have given them have said that the fishing has been excellent with a better quality of fish coming in there than from Eucmbene. Some excellent fish on the troll this week. With slow trolled Flatfish taking some great Browns. Cowbells with worms or mudeyes have been great trolled on flatlines. The RMG #35 Scorpion the 'King Brown' holographic gold is still THE lure! Other consistent lures include Tasmanian Devils in Cols PP, 36, 3, 48, Holo, and Y62. Our own Alpine Cobra's in the Alpine special, Alpine Attractor, and Lime Spiders patterns. Best trolling areas have been around the Dam wall and main basin. 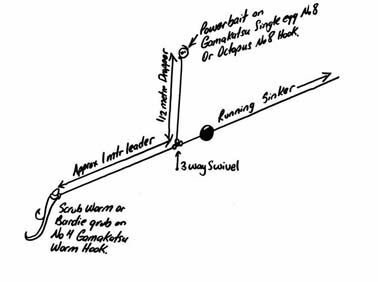 *Robert, Leigh, Neil, Ken, and John from Melbourne managed 51 (many released) fish on Scrub worms fishing out from Braemar Bay. John Coles scored the biggest with a 3.6kg Brown which is going to our local taxidermist. They also caught 21 fish on the troll. Well done fellas.